Brigham Young sent skilled men to settle in different locations. A group was sent in the spring of 1853, down from the Iron County along the Black Ridge and then along the stream we now call Ash Creek. About six families came and settled in 1858. When they arrived they found a group of Indians calling themselves the Paiute or Toquit or Toqurat Indians living along the creek and cultivating a small piece of ground. Chief Toquer lived there in a tent of leaves formed over a framework of cane and willows. The new settlers considered him an enlightened Indian, friendly and with clean habits. The name "Toquerville" was given to the new settlement, taken from the Indian word 'toquer', (pronounced toe-ker), meaning black. With the abundance of black rock on the hill to the East of the new town and in the fields surrounding the town, the name was appropriate. The first homes in Toquerville were made of logs filled in with mud. Ash Creek was just a small ditch one could step over, but the floods kept washing the dirt away and opened up new springs. The first dozen families found the water so scarce they got discouraged and moved to Kanarra. As the water increased they took up land on the west side of the stream. At first cotton was discouraged as they could not exchange it for breadstuff. In 1859 there were 19 families at Toquerville, who were prospering remarkable well, and at this time were very busy putting in wheat and other crops, and making fences and other improvements. One of these improvements was the erection of their first meeting house. It was of Adobes, and about sixteen by twenty feet, and also used for school purposes. The town became known for its fruits and nuts and once had a thriving cotton gin. The busy village came to be likened to an oasis in the Arabian Desert, as the traveler emerged from the harsh desert to a cultivated island of green growing things. One fruit Toquerville became famous for was excellent figs, with people traveling from everywhere to buy the crop. One story tells of a buyer coming for figs with nothing but his hat to carry them. When he asked the price for a hat full from the young woman selling them, she asked if fifty cents would be all right. From that incident came the standard Toquerville rate of fifty cents for a hat of figs. Black rock, Indian, and figs are just a few of the things that make this desert oasis unique. Look around and see the history still here in the Town Hall and many of the historic homes around town. Clippings from the Deseret News 1868 by Martin Slack - - Peace Dwells in the hearts of the people, everyone busy, no loafers, no office seekers, no gambling saloons, no drunkards in our town. We all mind our own business - - we are all helping to build Zion, the City of our God. The first sight of this thriving village gave the impression said to be experienced by the traveler who suddenly comes to an Oasis in an Arabian desert. The Toquerville community values its historic and cultural heritage, family-oriented atmosphere, abundant open spaces, recreational opportunities, responsive government, and its healthy and happy atmosphere for all residents through all stages of life. Toquerville is located about thirty miles south of Cedar City in a wide valley flanking Ash Creek and at the base of a mountain capped with black lava rock. Our Freeway exit 27 off of Interstate 15 is the Northern gateway to Zion National Park. With an elevation of 3,394 feet, it has a climate conducive to the growth of pomegranates, figs, peaches, and grapes. Pure, cold water pulses from springs a mile above town to furnish an ample supply of culinary and irrigation water. It is an oasis in the desert. Toquerville was a special place then and still is today with its spectacular natural setting and man-made amenities. Toquerville is a great place to live or visit. The City is located about 30 miles south of Cedar City and less than 20 miles north of St. George in a wide valley flanking Ash Creek and at the base of a mountain capped with black lava rock at an elevation of 3,394 feet. The area has good water available from springs about a mile above town. The water from the springs is used for culinary and irrigation and is one reason why Toquerville has long been known for its fruit, grapes, alfalfa, and other agricultural pursuits. Ten miles to the northwest of town are the Pine Valley Mountains. State Highway 17 runs through the center of town. Over this road millions of tourists have passed on their way to Zion National Park, Grand Canyon, and Lake Powell. Toquerville is the gateway to eastern Washington County and adjacent to national parks and recreation areas. In early June 1854 eight members of the Southern Indian Mission, led by Rufus C. Allen, left Harmony to visit Toquer, chief of the Paiute Indian band on lower Ash Creek. Their primary objectives were to learn the natives' language and convert some of the tribe to Mormonism. In response to Toquer's friendly reception, the missionaries promised to return, live among the Indians, and teach them how to farm the white man's way. That promise was kept when in the spring following the Mountain Meadows Massacre of 1857, several families, with Joshua T. Willis as branch president (from Harmony Ward), built log cabins near Toquer's village along Ash Creek. That fall, Indian interpreter Nephi Johnson, guided by a local Paiute, took an old Indian trail from Toquerville up over the Hurricane Ledge to explore as far as the Zion Narrows in the upper Virgin River Basin. His report to Isaac Haight at Cedar City was so positive regarding the establishing of settlements that orders were given to begin immediately to build a wagon road over the path taken by Johnson. A half-dozen men started work in early December, got their wagons up to the mouth of North Creek where it reaches the Virgin River, built an irrigation system, and laid out the town of Pocketville (Virgin). All of the farm sites were promptly taken by Mormons who had abandoned San Bernardino during the Utah War. Additional settlements soon followed along the upper Virgin River drainage--Duncan's Retreat, Grafton, Shonesburg, Adventure, Springdale, and Northrup. All of these communities, along with Toquerville, became part of the LDS Church's Cotton Mission. Toquerville, as the area's cultural and religious center, grew rapidly--from nineteen families in 1859 to forty-one families in 1864. The increase resulted in part when the main body of Cotton Mission colonists was called to Dixie late in 1861 and a number of them went to Toquerville. Providentially, water from Toquerville springs increased after the floods of 1861-62; new springs and new channels were opened up, allowing irrigation on the west side of Ash Creek. A post office, the first to be authorized in Utah south of Cedar City, was established, with John Menzies Macfarlane as postmaster. James McFate erected a primitive hand-powered cotton gin. John Nebeker followed with a water-powered mill built in a rock building (still standing). Charles Stapley, a transplant from San Bernardino, is generally credited with growing the first alfalfa in Dixie and probably Utah. By 1864 Toquerville reported twenty-four acres of lucern (alfalfa) under cultivation. It was in 1864 that the territorial legislature defined Kane County and created it from the eastern portion of Washington County. Toquerville was designated as the county seat. Boundaries changed again in 1883, and Toquerville was shifted back into Washington County. Toquerville has deep, well-drained soils and temperatures ideal for growing grapes. The Mormon Wine Mission had no formal call but was ancillary to the Cotton Mission of 1861. Wine of their own make was important to the Mormons because Joseph Smith, the church's founder, had a revelation that they were to use water in the sacrament, unless they had wine of their own make. Master vintner John C. Naegle was called by Brigham Young to establish and operate a winery in Toquerville and to instruct the people in the process of making wine. Naegle built a big rock house with a wine cellar underneath large enough to accommodate a wagon and a team of horses and allow them to turn around. He installed vats, presses, and other paraphernalia for fermenting wine. The product was stored in 500-gallon casks and shipped to ZCMI in 40-gallon casks. Not only was the wine paid as tithing but large amounts went to Pioche, Silver Reef, and to the settlements north. It became a major industry. In mid-January 1867 the Deseret State Telegraph line opened between Salt Lake City and Toquerville. The town was incorporated in 1917 and bonded to build a closed culinary water system. Electric lights were installed that same year. During the prosperous years of Silver Reef, water from Toquerville springs was used to run a stamp mill where ore from the reef was brought in and made into bars of silver. Ten miles to the northwest of town are the Pine Valley Mountains. On the east slope were shingle- and sawmills operated by Nathan C. Tenny, Thomas Forsythe, and Appleton M. Harmon. Timber and shingles from the mills supplied a great portion of Washington County. Using his timber supply, Harmon contracted with Brigham Young to build the Washington Cotton Mill. State Highway 17 runs through the center of town. Over this road millions of tourists have passed on their way to Zion National Park, Grand Canyon, and Lake Powell. Toquerville is the gateway to eastern Washington County and the adjacent national parks and recreation areas. 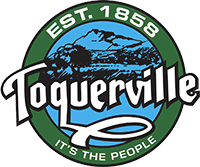 Toquerville has grown steadily over the last ten years, with a population now exceeding seven hundred citizens. In anticipation of continued growth, the town board has annexed five and one-half sections of land on its northern boundary, including Anderson Junction. Snowfall is usually limited to a nighttime accumulation of 2-3 inches, just enough for the children of town to scrape up enough for a snowman before school, and usually melted by noon. Spring and fall are glorious times of year with bright warm days and cool nights so typical of the dry desert. Due to it’s location, Toquerville is subject to strong winds, often out of the north in the winter. Rainfall is sparse, humidity extremely low, and conversations about the weather generally plentiful.